Reduced forced expiratory volume in one second (FEV1) has been linked to non small cell lung cancer (NSCLC). However, it is unclear whether all or only certain histological subtypes of NSCLC are associated with reduced FEV1. Moreover, there is little information on whether gender modifies this relationship. Using a large tissue registry, we sought to determine the relationship between FEV1 and subtypes of NSCLC and determine whether this relationship is modified by gender. We used data from patients who underwent tumor resection for NSCLC at a teaching hospital in Vancouver and had various pre-operative clinical measurements including FEV1. We divided the cohort into quartiles of predicted FEV1 and using both logistic and linear regression modeling techniques determined whether FEV1 was related to the occurrence of adeno or squamous cell carcinoma in men and women. There were 610 patients in the study (36% females). On average, women were more likely to have adenocarcinoma than were men (72% of all cases of NSCLC in women versus 40% in men; p < 0.001). In women, there was no significant relationship between FEV1 and the risk of any histological subtypes of NSCLC. In men, however, there was an inverse relationship between the risk of adenocarcinoma and FEV1 such that the lowest quartile of FEV1 was 47% less likely to have adenocarcinoma compared with the highest FEV1 quartile (adjusted odds ratio, 0.52; 0.28 to 0.98; p for trend, 0.028). The reverse was observed for squamous cell carcinoma. In individuals undergoing lung resection for NSCLC, the risk of adenocarcinoma and squamous cell carcinoma of the lung varies as a function of FEV1, independent of smoking intensity in men but not in women. These data indicate that women are much more susceptible to adenocarcinoma than are men especially when they have normal or near normal lung function. It may thus be useful to conduct periodic surveillance chest radiographs in asymptomatic female smokers (or ex-smokers) to ascertain peripheral nodules or masses before distant metastases occur since adenocarcinomas tend to metastasize earlier in the disease course than squamous cell carcinomas. Lung cancer is now an epidemic in women. Although the incidence of lung cancer has stabilized in men, there continues to be a dramatic increase in lung cancer cases in the female population. In 2003, an estimated 80,100 women in the United States (US) were diagnosed with lung cancer and 68,800 died from this disease . In women, lung cancer has surpassed breast cancer as the leading cause of cancer mortality in 1987 and now accounts for 25% of all cancer deaths . In both men and women, cigarette smoking is the leading causative factor for lung cancer. Compared to never-smokers, smokers have a 20-fold increase in the risk for lung cancer . Interestingly, reduced forced expiratory volume in one second (FEV1), an important indicator of lung function, has also been linked with lung cancer, independent of the effects of cigarette smoking [3–5]. A study by Wasswa-Kintu et al. found that FEV1, in a severity-dependent manner, was associated with lung cancer incidence and mortality even after adjustments for smoking intensity and status. Importantly, they found that even a very modest reduction in FEV1 (within the "normal" range of values) significantly increased the risk of lung cancer among current and former female smokers. In men, however, the increase in risk was much less pronounced. This study, however, did not include information on histological subtypes of lung cancer. It is therefore unclear whether the modifying effects of gender on the relationship between FEV1 and lung cancer impacted the risk for adenocarcinoma, squamous cell carcinoma or both. Such information would be valuable in gaining a better understanding of the potential differences (or similarities) in lung cancer susceptibility between men and women. To investigate this question, we analyzed data from a large cohort of individuals who underwent surgical resection for a small peripheral tumor. Data were obtained from patients who required surgical treatment of Stage 1 and II lung cancers at St. Paul's Hospital in Vancouver, Canada between 1978 and 2003. All resected tumors were examined by board-certified pathologists, who were unaware of the patient's lung function measurements at the time of the histological assessment. The histological subtype was diagnosed on surgical specimens according to the World Health Organization classification . Because very few patients with small cell carcinomas undergo surgical resection, we restricted the analysis to non-small cell lung cancers (NSCLC). For analytic purposes, bronchoalveolar carcinoma was included in the adenocarcinoma group. As part of their pre-operative work-up, all patients completed a pulmonary function test that met the standards of the American Thoracic Society . From this test, FEV1, forced vital capacity (FVC) and transfer coefficient for carbon monoxide (KCO) were determined. 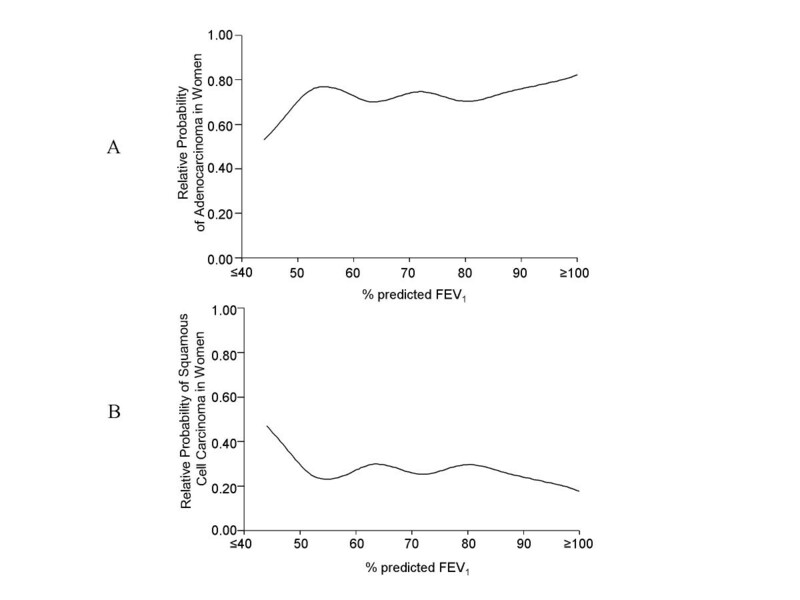 We applied a prediction equation to calculate predicted FEV1 values for each patient . Clinical information including age, gender, height, weight, and tobacco smoke exposure were also collected pre-operatively. Tobacco smoke exposure was estimated by using current smoking status, and the number of cigarettes smoked per day (pack-years of smoking). Arterial blood gas measurements on room air were also obtained in these patients. Continuous variables were compared using a Student t-test and dichotomous variables were compared using a chi-square test. To determine the relationship between FEV1 and the risk of adeno and squamous cell carcinomas in both men and women, we divided the groups into quartiles based on FEV1 within each gender category. We arbitrarily defined quartile 1 as the category with the highest predicted FEV1 and quartile 4 as the category with the lowest predicted FEV1. Using quartile 1 as the referent, we compared the odds of adenocarcinoma (or squamous cell carcinoma) across the quartiles of FEV1 in a logistic regression model. To the crude model, we added age, body mass index (BMI) and pack-years of smoking as covariates as they were significantly related to FEV1 and the risk of adenocarcinoma (and squamous cell carcinoma). These variables were included as both categorical and continuous variables. As there was no material difference in the results, for simplicity, we included them as continuous variables in the final model. To test for a linear increase (or decrease) in the odds ratios (OR) across the quartiles of FEV1, we used a chi-square test for trend, which adjusted for age, BMI and pack-years of smoking. We also performed a linear regression analysis in which we considered predicted FEV1 as a continuous variable rather than as quartiles to test the robustness of the data. We constructed fitted curves using a cubic spline method to visualize the results (figures 1 and 2). Similar analyses were performed using squamous cell carcinomas as the dependent variable. All analyses were conducted using SAS software version 9.1 (SAS Institute, Carey, N.C.) and SPSS version 11.0 (Chicago, IL). Two-tailed P-values less than 0.05 were considered significant. Continuous variables are expressed as mean ± SD, unless otherwise specified. 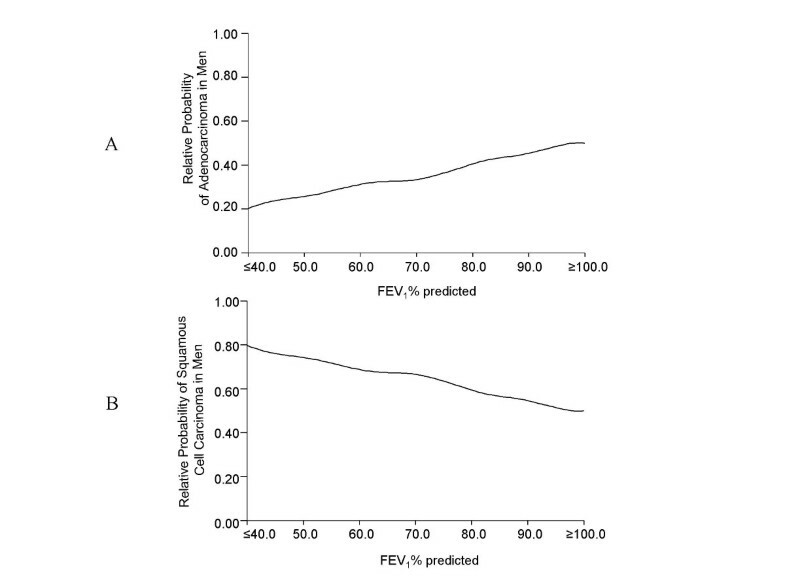 The Relative Risk Of Adeno (A) And Squamous Cell Carcinoma (B) According To Baseline FEV1 Measurement In Women Who Underwent Tumor Resection For Non-Small Cell Lung Cancer. Curves were fitted using a spline technique. The Relative Risk Of Adeno (A) And Squamous Cell Carcinoma (B) According To Baseline FEV1 Measurement In Men Who Underwent Tumor Resection For Non-Small Cell Lung Cancer. Curves were fitted using a spline technique. In total, there were 640 patients during the study period, who were diagnosed with NSCLC and who provided informed consent to use their lung tissue for research purposes. Twenty-two patients (3% of total) were excluded because they had undifferentiated tumors that could not be confidently classified into one of the two major histological subtypes of NSCLC. Additionally, eight patients were excluded due to insufficient information on the clinical variables of interest (e.g. FEV1). This left 610 patients for analysis. The baseline characteristics of these patients are summarized in Table 1. There was a significant difference in the gender distribution of adenocarcinoma (40% in men vs. 73% in women; p < 0.001) and squamous cell carcinomas (57% in men vs. 24% in women; p < 0.001). Smoking status at the time of surgery was similar between male and female patients (p = 0.082), though overall, men had higher pack years of smoking compared with women (p < 0.001). Similarly, there was no difference in age between men and women (p = 0.496). Male patients had slightly lower FEV1, FVC and arterial oxygen tension (PaO2) than did female patients (Table 1). A Comparison of Baseline Characteristics Between Men and Women With Non-Small Cell Lung Cancer, Who Underwent SurgeryContinuous variables are expressed as mean ± SD and dichotomous variables are expressed as % of column totals. Table 2 summarizes the unadjusted and adjusted odds ratios (controlling for covariates which included age, BMI and cigarette smoking) for adenocarcinoma and squamous cell carcinoma in women across quartiles of FEV1. In women, at all levels of FEV1, the odds of adenocarcinoma were much higher than that of squamous cell carcinoma (figure 1a and 1b). However, the odds did not vary as a function of FEV1. In contrast, in men, the histological subtype varied significantly across the FEV1 quartiles (Table 3). Reduced FEV1 was associated with higher odds for squamous cell carcinoma, while at higher FEV1 values, adenocarcinomas predominated. These data did not change significantly when FEV1 was evaluated as a continuous rather than as a categorical variable (Figures 2a and 2b). Neither forced vital capacity nor transfer coefficient for carbon monoxide was significantly related to NSCLC histological subtypes in either men or women. The most important and novel finding of the present study was that in women the risk for adenocarcinoma did not vary as a function of FEV1. At all levels of FEV1, adenocarcinomas predominated, constituting ~70% of all NSCLCs in the female population. In men, however, FEV1 made a material difference to the risk for adeno and squamous cell carcinomas. At reduced FEV1, men were far more likely to develop squamous cell carcinoma than adenocarcinomas; the reverse was true when FEV1 was in the normal or near normal range. These results are consistent with those reported by Papi et al. who found that individuals with chronic obstructive pulmonary disease (COPD) with mildly impaired FEV1 (~70% of predicted) had a four-fold increase in the risk for squamous cell carcinoma compared to those with normal lung function (FEV1, ~93% of predicted). However, this study could not comment on the potential modifying effects of gender because they had only 18 female subjects (representing 13% of the total subjects). We extend their findings by demonstrating that the risk of squamous cell carcinoma increases with decreasing FEV1 in men but not in women. The mechanism(s) responsible for the apparent increase in the risk of adenocarcinoma in women are largely unknown. However, several possibilities exist. Firstly, there may be differences in genetic susceptibility. For instance, women for unknown reasons have more frequent mutations and transversions in the p53 gene than do men and aberrations in this gene have been associated with increased risk of adenocarcinoma . Secondly, hormonal differences may impart differential risk of lung cancer between men and women. NSCLCs have been associated with increased expression of estrogen receptor β in chromosome 14 . Stimulation of this receptor may have a role in the up-regulation of CYP1A1 gene. This latter gene encodes for an enzyme that has an integral role in the production of polycyclic aromatic hydrocarbons (Phase 1 enzymes), which may be carcinogenic . Consistent with this notion, female smokers have increased expression of CYP1A1 than do male smokers . Further investigation is required to investigate if estrogen has a causal link to adenocarcinoma by promoting carcinogenesis through increased CYP1A1 or other related pathways. Thirdly, inflammation may play a primary role in the increased susceptibility of women to adenocarcinoma. Inflammation has been incited as an important part of the pathogenesis of certain types of lung cancer. Ardies  suggests that infection or toxic chemicals can incite a vigorous inflammatory reaction in the airways, producing certain by-products that may promote carcinogenesis. In NSCLC, cyclo-oxygenase 2 (COX-2) gene is over-expressed in nearly all stages of disease progression  and downstream enzymes of the COX-2 pathway involved in prostanoid synthesis such as prostaglandin E2 synthase is also up-regulated . This inflammatory pathway has been implicated in the progression of lung cancer by inhibiting apoptosis, promoting angiogenesis and facilitating microinvasion of tumor to adjacent tissue, leading to tumor growth and metastasis [18, 19]. Moreover, COX-2 activity has been associated with poorer prognosis in NSCLC . Interestingly, Szczeklik and colleagues showed that in the asthmatic population, women were five times more likely to have a polymorphism in the COX-2 promoter region, -765G>C, compared to men (5% versus 1% frequency). This polymorphism is associated with increased production of prostaglandin (PG) E2 and D2 . Indeed, monocytes cultivated from individuals with the C-C genotype produce levels of PGE2 and PGD2 that are 25 to 34 fold higher than that obtained from individuals with the G-G genotype . The importance of this promoter polymorphism in the genesis of NSCLC is unknown. Gender differences in the incidence of subtypes of NSCLC may also reflect subtle yet important differences in airway biology. In an experiment by Van Winkle et al. , female mice exposed to naphthalene, a chemical found in mainstream and sidestream smoke, were more likely to suffer airway damage than were male mice. Interestingly, for largely unclear reasons, the naphthalene-induced lung damage occurred predominantly in the distal airways, which is the usual site of adeno but not squamous cell carcinomas. Adenocarcinomas tend be more peripherally located than are squamous cell carcinomas . As such, patients are often asymptomatic until distant metastases occur. Unfortunately, by then, curative resection is not feasible. Our data indicate that women are much more susceptible to adenocarcinoma than are men especially when they have normal or near normal lung function. It may thus be useful to conduct periodic surveillance chest radiographs in asymptomatic female smokers (or ex-smokers) to ascertain peripheral nodules or masses before distant metastases occur. A large clinical study is needed to validate this notion and to determine the cost-effectiveness of this approach. There are several limitations to the current study. Firstly, because individuals with severely impaired FEV1 do not usually undergo surgical resection for their lung cancer, the relationship between FEV1 and various cell types of lung cancer in individuals with FEV1 less than 50% of predicted remains unknown. Secondly, we did not have data for individuals with advanced stage lung cancers as these patients usually do not undergo surgery for their disease. However, there is no material reason to believe that inclusion or exclusion of such patients would change the findings of this study. Thirdly, we did not have data on small cell carcinoma because this type of lung cancer metastasizes very early on in the disease course and as such is not usually amenable to surgical resection. The effect of gender on the relationship between small cell carcinoma and FEV1 remains unknown. In summary, the present study demonstrates that the risk of adeno- and squamous cell carcinoma of the lung varies as a function of FEV1, independent of smoking intensity in men but not in women. In women undergoing lung resection for cancer, adenocarcinoma predominates across all levels of FEV1. These data raise the possibility that there are fundamental differences in the airway biology between women and men, which confer increased susceptibility of adenocarcinoma for female smokers. Given that the incidence of lung cancers continue to rise in women, it is imperative to further investigate these gender differences such as the role of inflammation as well as hormonal, molecular and the genetic factors to explain why women are more prone to develop adenocarcinoma. The authors wish to thank Dr. Mark Elliott for collating the data files for this project. DDS is supported by a Canada Research Chair (Respiration) and a Michael Smith/St. Paul's Hospital Foundation Professorship in COPD. SM and DDS participated in data acquisition, performed statistical analysis and drafted the manuscript. WG participated in data analysis and drafting of manuscript. SL provided important intellectual input to the analysis and in drafting of the manuscript. SFP participated in data interpretation, analysis and drafting of the manuscript. All authors read and approved the final manuscript.